Award winning hull design by Roger Hill with the capability and capacity to go anywhere with excellent comfortable cruising facilities. This vessel was given a total refit and make-over in November 2017 with all new Raymarine electronics still under warranty including radar, plotter and pilot, an Enerdrive 1,000W inverter, Fusion stereo, WiFi range booster, and more. 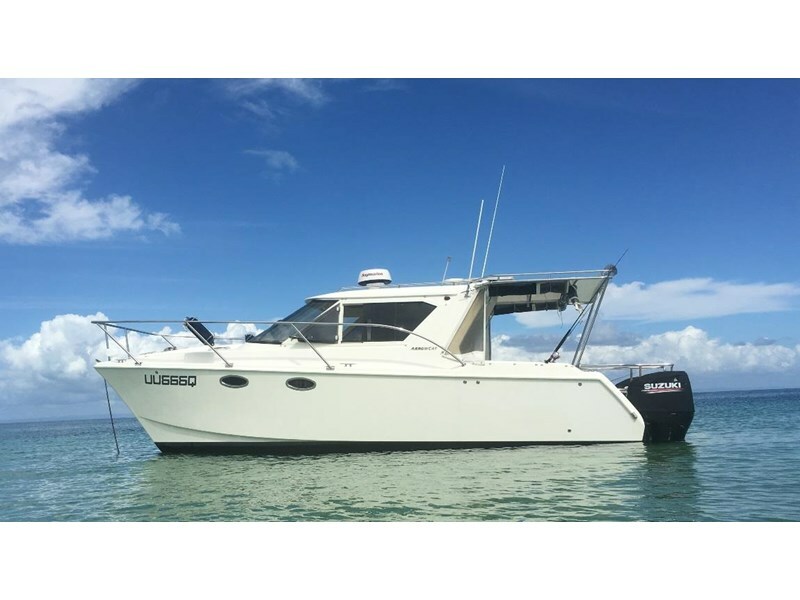 It is powered by twin 250hp 4stroke Suzuki outboards with only 310 hours, it is air conditioned, has an opening cockpit access door, and the head shower area is in a separate side of the boat to the large queen double, and has a new unused Honda 2KVa generator. This is one out of the box, please call to make a time to inspect. 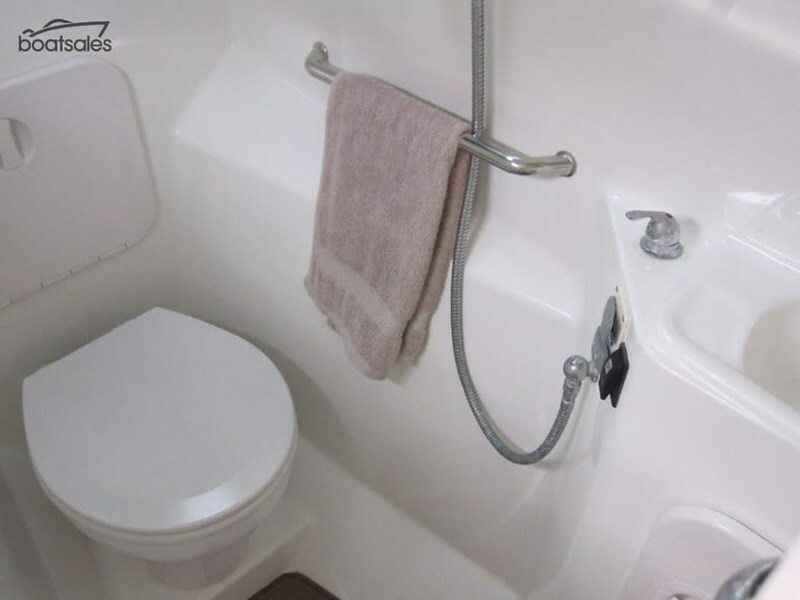 Sunshine Boat Sales offers the details of this vessel in good faith but cannot guarantee or warrant the accuracy of this information nor warrant the condition of the vessel. A buyer should instruct his agents, or his surveyors, to investigate such details as the buyer desires validated. This vessel is offered subject to prior sale, price change, or withdrawal without notice. ** NOW REDUCED to $24,995 tow away! ** Stessco FS540 Bowrider (2008) Aluminium bowrider Yamaha 115CETO 115Hp 2S 181hrs (2008) Stessco 52LS13MD boat trailer (11.2008) Are you in the market for an affordable aluminum bow rider? Well the team at JCM have just landed this wonderfully optioned and well-presented Stessco FS540 Bowrider. As the pictures depict the boat easily lends itself to a spot of fishing or simply relaxing on the lounges from bow to stern. Stessco boats are locally made here in SE Qld and make a great range of boats and the bowrider is one of the most popular social designs they make as it ticks so many boxes. The hull is very beamy which generates great stability at rest and has very high internal freeboard making safe when young ones are aboard. Re-boarding after a swim or a snorkel is easy as the transom is fitted with a boarding ladder and a transom door as pictured. First Impressions Powered by the ever-reliable Yamaha 115Hp Saltwater Series 2 stroke that has recorded a low 181 hours use. The JCM workshop has also completed a presale mechanical inspection and we back the motor with a limited BIA engine warranty for buyers confidence again why take the risk buying privately? For the Skipper The helm is comfortable with excellent viewing and the dash is well laid for the skipper with Yamaha digital engine gauges, a Humminbird 757C combo colour screen sounder/GPS providing fish finding and location along with a VHF radio and a stereo for those that like their tunes whilst afloat. Overhead a large bimini top provides ample shade from the midday sun and this easily folds down into the bimini sock out of the way when not in use or towing on the highway. Also included are the clears, front and side curtains providing additional protection from the winds/spray. 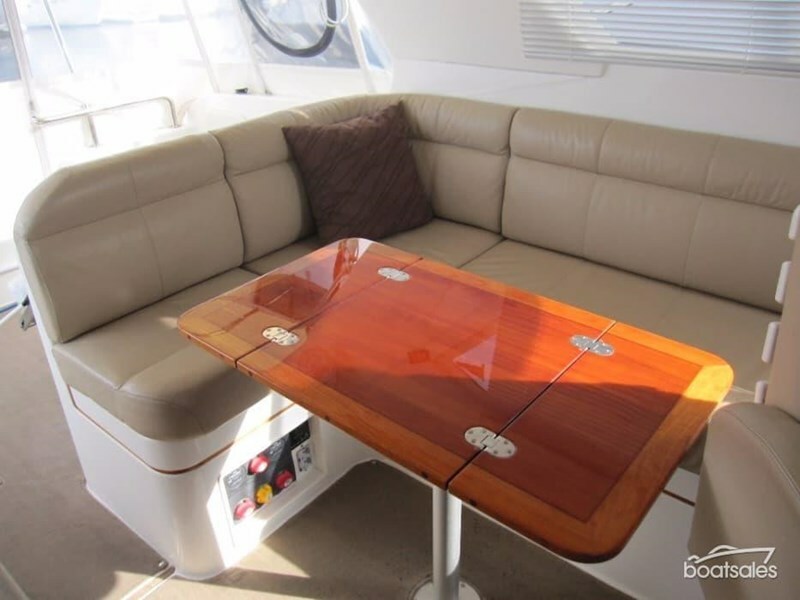 On the Water Seating up the bow is comfy with padded cushions and under the seating ample storage abounds for the safety gear and accessories. A bow cover is also included that covers this whole section when storing or boating in choppy waters. The cockpit is large with seating for 5 provided and the rear lounge is cleverly designed with storage under and it appears to be lined making it a great little day ice chest for drinks etc. For the angler in the family a bait board is fitted and a number of rod holders around the gunnel and overhead in the rod storage rack. Features & Accessories: Humminbird 757c colour combo GPS/Sounder with Australia Gold SD Map Card GME GX600 VHR radio with aerial GME GR100 stereo system Single battery in a battery box Underfloor fuel tank approx. 90L capacity S/S factory 3 blade propeller Yamaha digital engine gauges 4 adult life jackets, 2 paddles, v-sheet, bucket Fire extinguisher Sand anchor with rope & chain and a 2nd anchor Bimini top with front & side clears and bimini sock Bow cover 2 pedestal seats Rear lounge with padded back rest and ice box underneath Bow lounge with padded back rest Rocket launcher (hinged) Bait board Tackle storage draws Deck wash 2 step boarding ladder and a boarding platform Ice box Cockpit lights Windscreen grab rail Bow, side & transom rails Walkthrough transom and transom door Glove box, side pockets 12 rod holders & 3 drink holders throughout Painted alloy wheels On the Trailer The rig is trailered on an inhouse built Stessco 5.2LS13MD single axle trailer that marries to the hull like a glove. The trailer like all trailers sold through JCM will be sold compliant with brakes/lights etc all adjusted for your towing safety why take the risk buying privately? With an ATM of 1350Kg most mid sized 4WDs can tow easily within their towing limits. 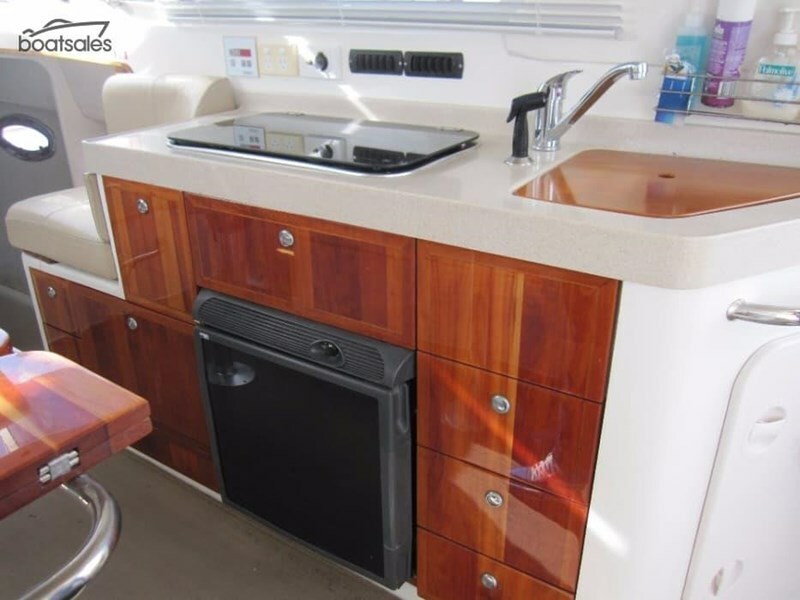 If you are in the market for a wonderful family and social boat and don't want the maintenance issues that can come with fiberglass boats, then this high volume, well optioned Stessco offers great buying at the now reduced price of $24,995 tow away backed with all the assurances that JCM provides.